What Americans have done to the desert is not encouraging. 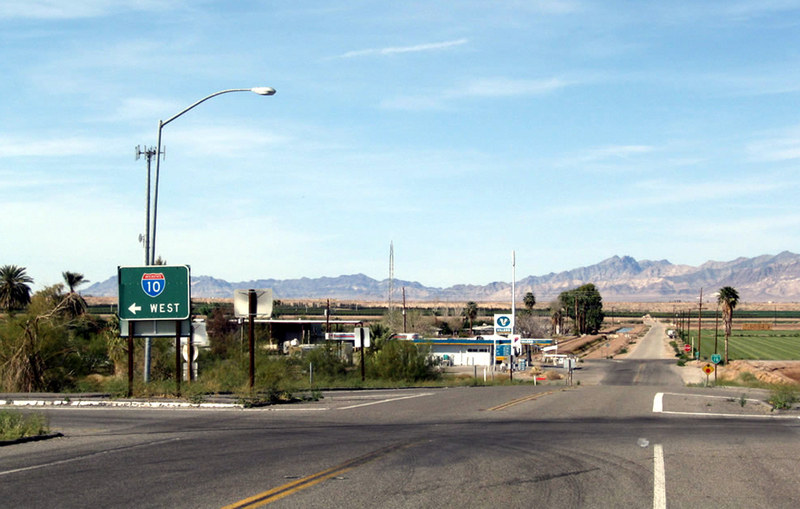 The drive from Blythe, Calif., to Brawley on California 78 is a microcosm of the problem. You can pile up the insults that the desert has suffered. 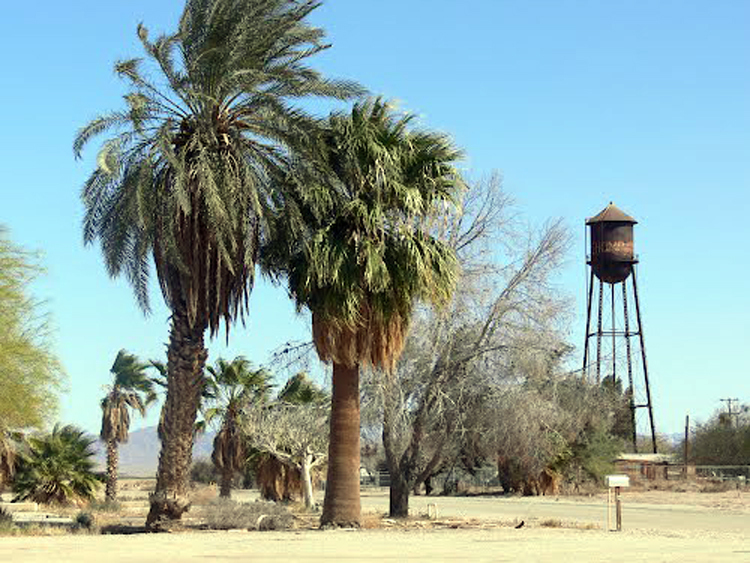 California 78 is an old, two-lane blacktop that passes through the agricultural area outside Blythe. Before you leave the river, you pass retirement communities and winter-resident trailer parks. They pile directly on scrap yards and petroleum tanks. One wonders what the attraction of living there might be. The whiff of gasoline in the dawn? The lulling sound of traffic on the interstate? Farther away from Blythe, the bustle of franchise foods and self-serve gas stations gives way to the quiet perpetuity of farmland. 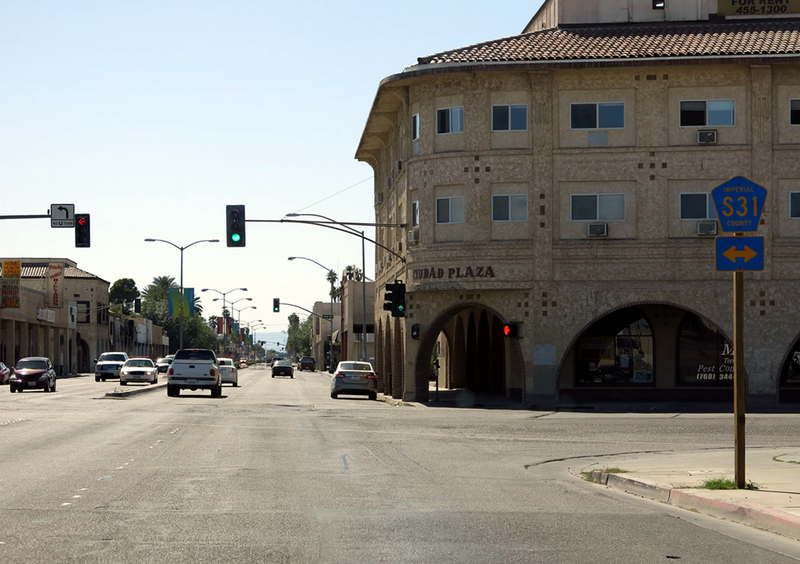 The buildings you pass are poor and the names on mailboxes and storefronts are largely Hispanic. Community stores, such as the ones in Ripley or Neighbors, are dilapidated and have graffiti sprayed on their side walls. The Colorado river plain is flat and fields spread out to the horizons. At one point, the highway passes close to the river, or rather, the oxbow lakes left behind when the meandering river cut through its own bottomland. The rushy, reedy water’s edge comes up to the shoulder. The road takes several right-angle turns — as such roads always do in farmland — and eventually passes beyond the reach of the canal irrigation and back into Sonoran Desert, with its ash-pile hills and scrubby creosote. But just as you think you are passing into wilderness, you find the slag hills of industrial mining. What appears at first to be mesas in the distance turn out to be piles of industrial debris. The closer you get, the more obvious are the dirt roads cut into the hills. Derelict mine-shaft machinery sits silhouetted on the horizon. And as you pass the Gold Basin Mine and the Rainbow Mine, suddenly the desert is fenced off, with spirals of barbed wire cresting the tornado fence that goes on for miles. But it is not a fence to protect the private property of the mine owners, rather it is to protect the desert tortoise. Signs every 50 yards or so posted on the fence warn you to keep out, that the tortoise is endangered and is protected behind the fences. But one look through the mesh and you know the tortoise hasn’t got much of a chance: The hills are slag and the dirt has been scraped flat. If there are mountains in the distance, they are hard to see as I drive through. A blue haze, the color of stale cigarette smoke, hangs in the air and blots out the view. When a range of mountains finally shows in front of you, it turns out to be not rock but sand. The Imperial Dunes cross the highway, catching the smoky, filtered sunlight at an angle, showing off their sensuous curves and rhythmic flow. But as soon as you are upon them, you see that the sand is not so smooth as you thought. In fact, it is scarred like a burn-victim’s skin. Every foot of dune is lined and corrugated with thousands and thousands of dune-buggy tracks. There is a section protected from the abuse, but outside the ”Angle” on the west side of the road, not a single square rod of unblemished sand remains. And I’m passing on a weekday, which tells me that this damage doesn’t repair so quickly as the sand on the beach that smoothes out after each change of tide. 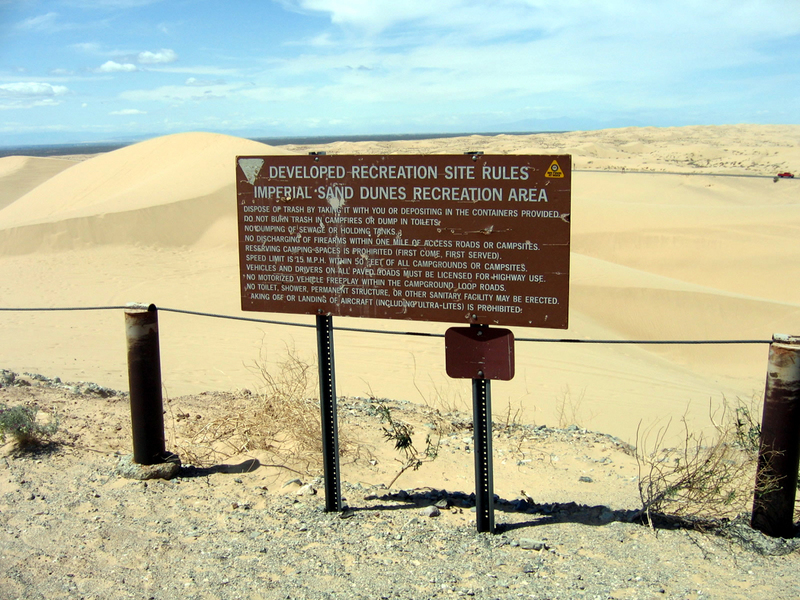 The dunes are still impressive: They are much more so here than along I-8, where most people are familiar with them. The view from the Osborne Overlook is like that from a mountain turnout. If it were not for the blue murk, you could see two states and two countries. As the road drops down from the dunes back into the desert, you think, perhaps, now it will be OK. But the signs along the road read ”Danger” and ”Peligro.” It is a live bombing range. Don’t enter the desert, the signs along the road warn, because there are unexploded shells buried in the sand. 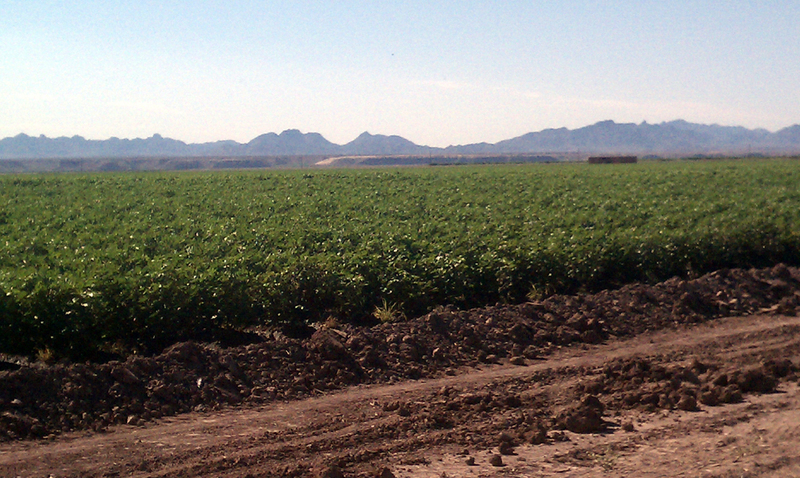 Finally, the road re-enters the agricultural area east of Brawley. A sea of green. Lettuce or sugar beet extend to the horizon, and more salt cedar trees are being cut down as they age and rot. More used farm machinery for sale. More small, wooden homes beside the road with old cars parked in their dusty driveways. The houses and the people you pass, with their donkeys in paddocks and their battered pickup trucks, seem like something directly out of the WPA photographs of the ’30s. You almost look for Tom Joad. Used farm machinery piles up in rusty lots. The town of Brawley is just as decayed. It once must have been a pretty place. The main street is wide, with an island down the middle. But along its edges are empty stores and a boarded-up movie theater whose style says that perhaps in the ’40s, it was the kind of place that people came to for a Hollywood escape from the hard life of the farm. Life in the desert has always been hard. It used to be hard on the residents and turned them into wizened whiskered eccentrics who live in lopsided mobile homes piled up with dirt on their sides. Nowadays, life in the desert remains hard, but it is hardest now on the desert itself.